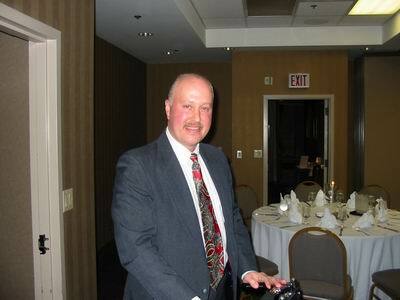 Tim Allen at the Volunteer of the Year Dinner in February 2004. Tim Allen – Tim started volunteering actively in Mira Mesa eight years ago on the revitalization of Sandburg Park. As chairman of the Sandburg Park committee of the Mira Mesa Recreation Council, he has been a catalyst for many improvements in the park including new playground equipment and an annual “Sandburg Park Volunteer Day”. Tim has been actively involved with the Mira Mesa Street Fair since its inception in 1999. He publishes the Street Fair Souvenir Program and coordinates all the static displays for the Street Fair. Tim has published the 4th of July Souvenir Program since 2001 and been responsible for soliciting major donations for the 4th of July fireworks. Tim was also the driving force behind the creation of the Mira Mesa Monster Manor, the annual Halloween haunted house started in 2001 to benefit the Mira Mesa 4th of July Committee. Tim organized over 200 volunteers and solicited over $30,000 in donations each year for this event. Tim also assists other groups in the community including: Friends of the Mira Mesa Library, Stakeholders, Halloween Carnival, Mira Mesa Presbyterian Church & Preschool and San Diego City Schools. 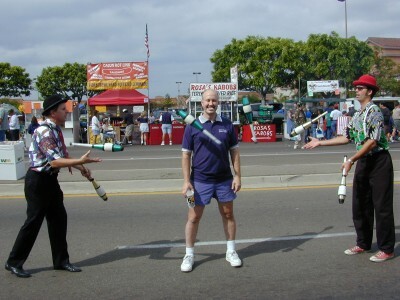 Tim Allen between jugglers at the 2001 Mira Mesa Street Fair.